Maintaining a universal software variant for international usage is a hard task. For example, parameters like Daylight saving time (DST) to network bands in mobile telephony often vary between countries. To tackle this situation, popular PC operating systems like Windows introduced the idea of locales. In computing, a locale is a set of parameters that defines the user’s language, region and any special variant preferences that the user wants to see in their user interface. Usually a locale identifier consists of at least a language code and a country/region code. Unlike PC, initial smartphones had a tiny amount of internal storage. Implementing a similar set of customized presets could be space consuming, so OEMs decided to make separate hardware models (yes, you read that right!) for the same phone. With time, the price of the flash storage chips decreased drastically. Smartphone makers started to incorporate bigger internal storage, which was proven useful for OS designers to store region specific configurations inside a unified update package. However, end users may not always aware of these design choices. Take the following example: some Galaxy S10 users reportedly can’t find an option to disable the camera shutter sound. Comment from discussion marblechair’s comment from discussion "Start a petition to toggle off the Cmaera sound on S10 series". 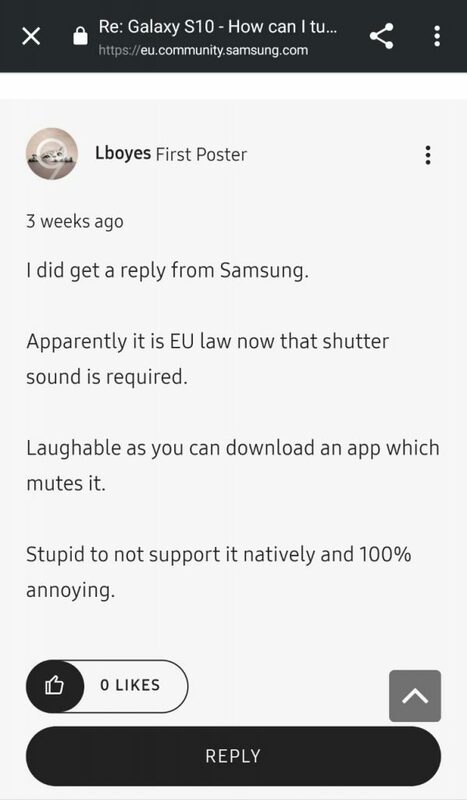 Users have found it little bit weird, as apparently some Galaxy S10 models do provide a simple toggle in the stock camera app to turn off the camera shutter sound. Comment from discussion TriBeCa187’s comment from discussion "Start a petition to toggle off the Cmaera sound on S10 series". According to a Samsung US Care Ambassador, carrier branded US models of Galaxy S10 should have the option of toggle camera shutter sound. Region code. Please take into account that this is UK forum and UK is still part of EU and some regulations are applied here, e.g. camera’s sound or high volume warning. 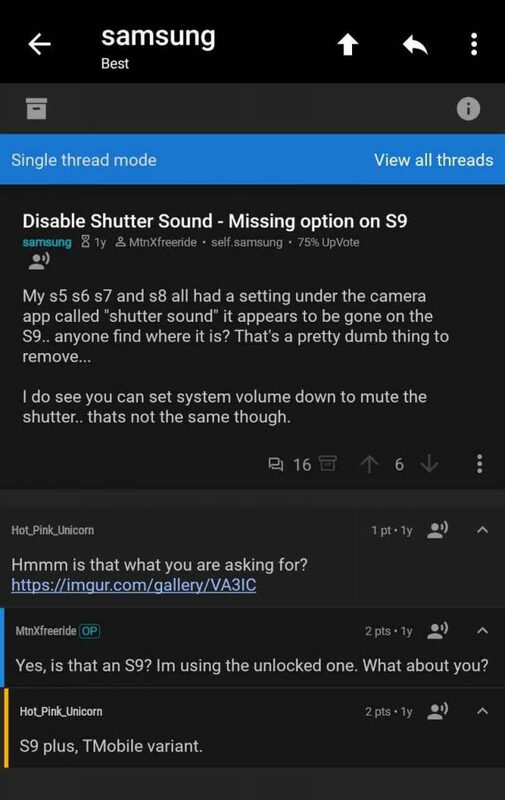 Digging back a little, we have found that carriers like T-Mobile do allow end users to turn off the camera shutter sound, but the option is missing from the unlocked US models sold directly via Samsung. 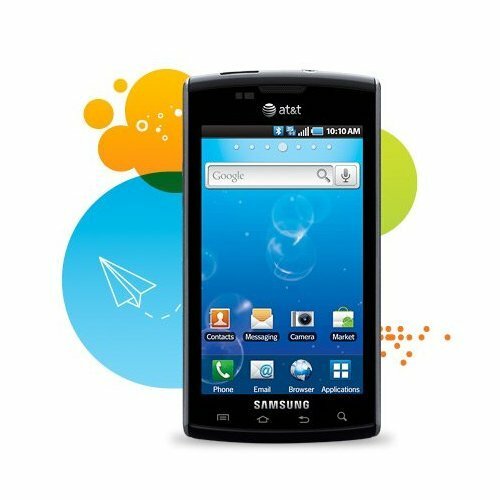 With the arrival of Android 4.1 Jelly Bean, Samsung engineers introduced a feature called CSC (Customer Software Customization) in their firmware. CSC is nothing but a set of predefined parameters which resides inside the root system partition of your Samsung device. Samsung and/or wireless carriers can easily make changes and prepare customized OS variants by setting appropriate values in the CSC. It is theoretically possible to change the CSC values manually and unlock hidden options, but you need to have root access to do that. People who don’t want to fiddle with rooting or flashing different firmware on their Galaxy S10 can use a simple trick using Bixby Routines to mute the shutter sound. You can achieve the output by manually muting the system sound, but automating it using Bixby sounds much easier. Comment from discussion Superyoshers9’s comment from discussion "Start a petition to toggle off the Cmaera sound on S10 series". Remember that local laws may still demand you to enable the shutter sound, so please consult the rules before shooting pictures in a sensitive area. 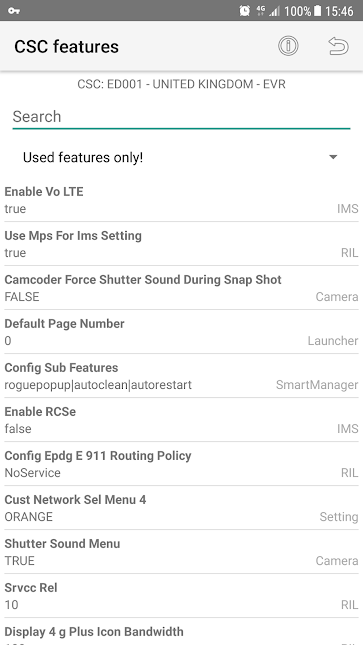 Do you have the option to toggle camera shutter sound in your Galaxy S10e/S10/S10+? Comment below.